Storage is cheap. Mistakes are not. Time is one of our most scarce resources. Buy some insurance with a Quick Backup! If you’re using the trusty CEWP (Content Editor Web Part) to locate the current web part frame on a page you’ll want to consider using the “_WPQ” expression instead of hard coding a number. 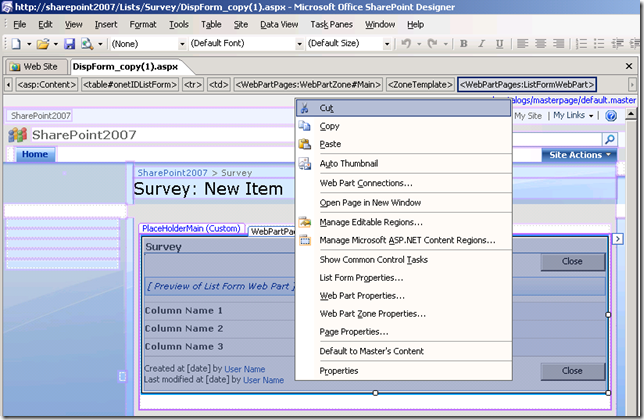 Using the Internet Explorer Developer toolbar or Firebug toolbar is a great way to locate <DIV> tags and “ID=” attributes with a single click. However, don’t be tempted to code in the number. As you re-order web parts they will changes. If you add more than one CEWP (export/import) the others will fail. Use a dynamic token for maximum flexibility. 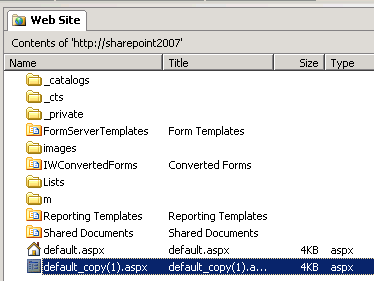 SharePoint’s rendering engine does a search replace on “_WPQ_” to give it the number of that web part on the page. It’s a great way to avoid naming conflicts and a trick I’ve used to apply multiple JQuery driven CEWP on the same page. 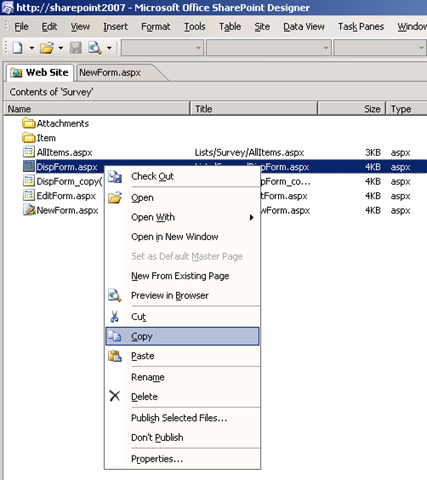 Many times I’ve been asked to adjust the NewForm.aspx (add record) experience for users to display a custom message after submit. A “Thank You” page for a survey is a great example. Other times in request forms people want to show a confirmation or instructions page. Thankfully the SharePoint product team made this easy for us developers. Often the destination page for #5 above doesn’t yet exist. So you’ll want to open SharePoint Designer 2007 and create a new ASPX page to hold a “Thank You” message. 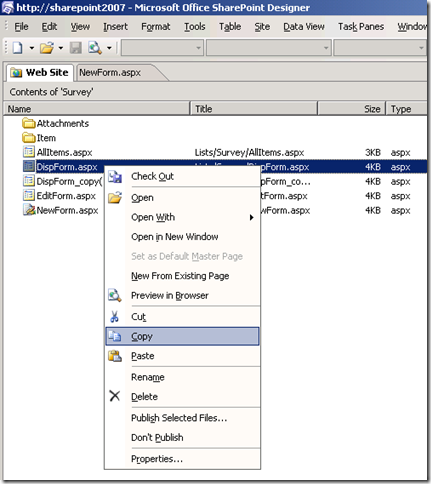 For this I always place the ASPX file in the same /Forms/ folder as the list I’m working on. Why? 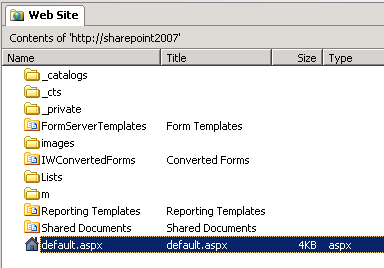 By placing a custom ASPX in the same /Forms/ folder it will be including in any List template (.STP) creation and is easier for future admin and dev staff to locate for troubleshooting. 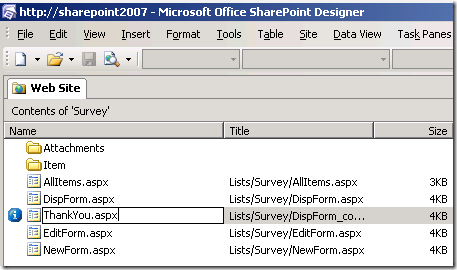 So you want to display a single random item from a SharePoint list? It’s a common request and a very handy one for visitors. Give your site a fresh relevant appearance with a dynamic web part. Web 2.0 requires us site designers to keep pace with visitor expectations. Let’s get to the fun part. 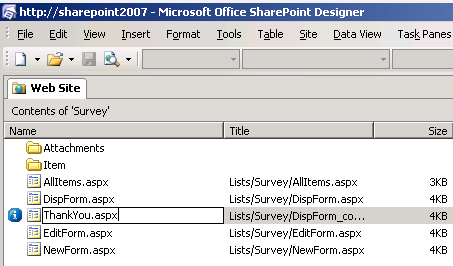 Here we’ll be using the Data Form Web Part (DFWP) sometimes called the Data View Web Part (DVWP) to present a SharePoint list with XSLT logic for the randomizer and conditional formatting to only show the target record. Watch this 4 minute movie clip to see a live demo. Steps are outlined below also. <xsl:variable name="Rows" select="/dsQueryResponse/Rows/Row"/> <xsl:variable name="dvt_RowCount" select="count($Rows)"/> <xsl:variable name="dvt_randomRow" select="ddwrt:Random(1,$dvt_RowCount)"
Locate the <TR> for starting a new row. Add the conditional pair below to apply the right CSS class when needed. Apply extra formatting (bold, colors, icons) to achieve a unique look for your audience.